Looks like an absolutely perfect way of spending one’s Saturday! 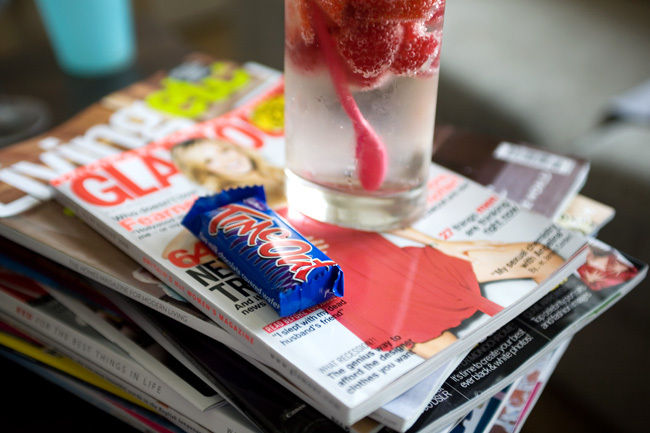 A pile of delicious glossy magazines, chocolate and a drink that looks at least as delicious as the magazines, but I don’t know what it is. What IS it? Heh, it’s just diet 7up with raspberries and strawberries in it. 😛 I like to eat the fizzy berries with a spoon. Hey you just gave me a good idea for a drink – merci! I love what you wrote about “a lovely clean slate of a weekend”… what a poetic way to say it, as well as awesome in itself. I went out and saw some other English-speaking bloggers yesterday here in Paris. It was so cool seeing these ladies in “real life”, and realizing how much their blogs really reflected their personalities. And lastly, thanx for the award;) Hopefully the glossy buddies piled up enabled you to blow off some steam this weekend!